Painting Acrylic on Canvas | 40" x 59"
Painting Acrylic on Canvas | 47" x 72"
I am greatly inspired by the simple life of the people in my native town. My works are often compositions of these scenic simple lives with a sense of mystery; for they live on the edge of urbanization and there is a sense of harmony in the air. I attempt to bring forth the misty, dreamlike nature of their lives. Whether in black and white, somber grey or bright primary colours, the tree that he paints, stands out resplendently, a sentinel to remind us of the havoc we seem to cause on the sacred face of the earth in our pursuit of selfish interests. 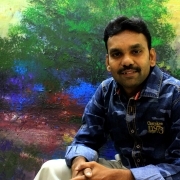 Bhaskar Rao majorly indulges in landscape and nature in his paintings. The Tree that can be seen in each of his work has remained constant as part of his oeuvre over the years in his career as a painter. At a cursory glance at his body of work, though it may appear that he seems to be involved and articulating his ideas through his vision of a landscape, it is primarily the image of the tree which stands out - which he keeps returning to over the years. Bhaskar has painted and drawn trees in myriad mediums and yet every time he has returned to it with a new vision.